Read our 5-star Customer Reviews! 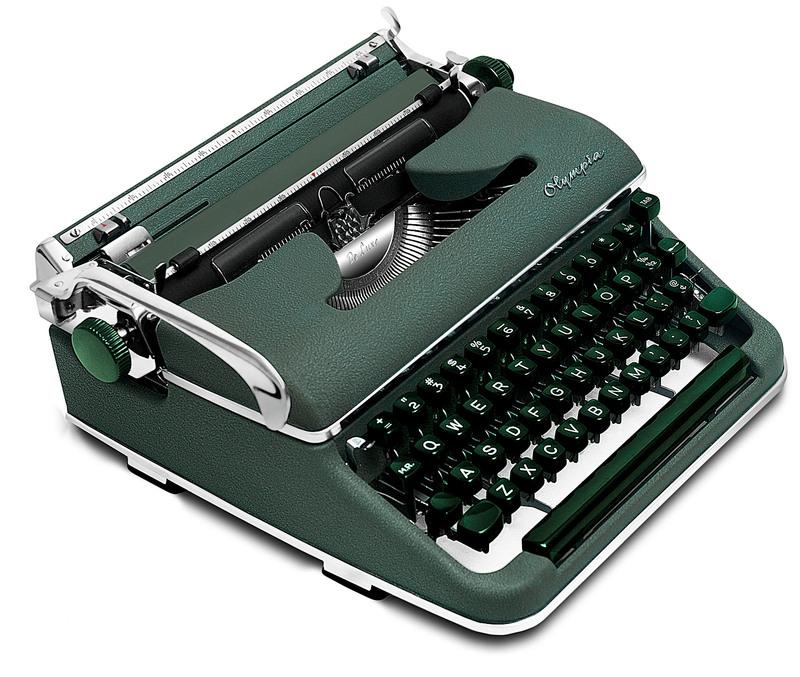 Typewriter: Like-New Restored (Refurbished) Condition; Green (original color). All Metal Construction. Guaranteed excellent mechanical operation. Case: Like-New Restored (Refurbished) Condition in Gray color. 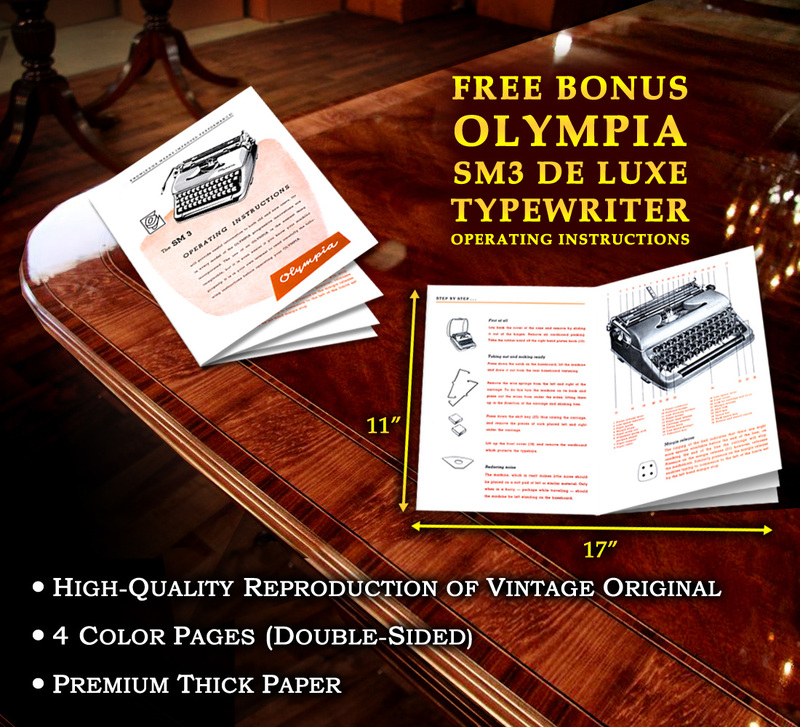 Includes: 1 Brand-New Black Ribbon Installed, Olympia Operating Instructions (High-Quality Color Reproduction of Vintage Original). LIKE-NEW PROFESSIONALLY RESTORED (REFURBISHED) CONDITION. Our Expert Technicians spent 15 hours professionally cleaning, restoring, servicing, adjusting, repairing and testing this vintage typewriter. Typewriter Body has 100% Original Color from Factory. The Platen was professionally refurbished to Like New condition. 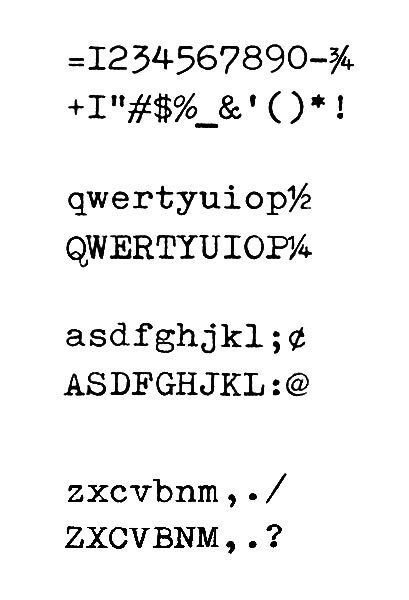 The Platen rubber contains light surface scratches that will not impact typewriter performance. Feet & Feed Rollers have been thoroughly cleaned. Typewriter Case was professionally cleaned and restored (brand-new paint). Guaranteed excellent mechanical operation. Free Lifetime Technical support via Email. * Manual Margin & Tab Sets * Single, Double and Triple Line Spacing settings * Variable line spacer * Carriage & Margin Release * Automatic ribbon reverser * Bi-color ribbon selector * Carriage shift * Carriage lock * Touch selector * And more! Olympia story begins in 1903, Berlin. Under the direction of Dr. Friedrich von Hefner-Alteneck, European General Electric developed Olympia manual typewriters. In 1921, the first successful Olympia Model 3 rolled into market. Two years later, the company set up shop in Erfurt, Germany. 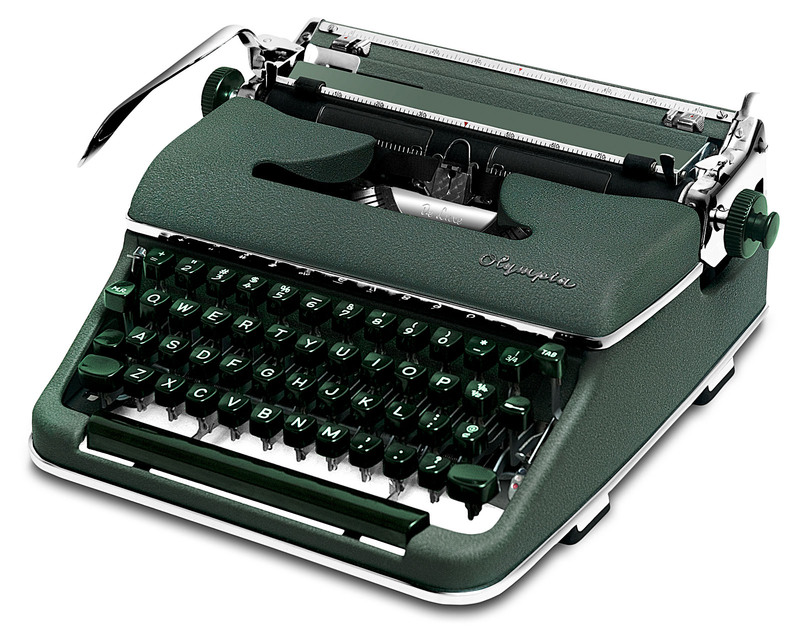 During 1930's, Olympia Simplex, Model 7 and Model 8 gained popularity worldwide. By 1943, World War II raged over European skies. Allied Forces bombed the city of Erfurt and severely damaged the Olympia Factory. In April 1945, eleven remaining employees survived the capture by Soviet Forces. The East German government seized the Olympia Factory and renamed it "Optima." Several employees fled to West Germany and set up shop in Wilhelmshaven. From late 1940's onward, Olympia enjoyed worldwide success. By 1961, half of all typewriters in West Germany were built by Olympia: Simplex, Progress, Elite, SM and SF Portables. Olympia machines ("Mercedes Benz" of typewriters) are legendary for their craftsmanship, eye-catching design and exceptional reliability. These machines were favored by authors Woody Allen, Patricia Highsmith, Stan Laurel, Robert Penn Warren, James Michener, Evan S. Connell and Carson McCullers. Olympia Typewriters are perfect for enthusiasts who wish to own an aesthetically pleasing object but also want to type to their heart's content. We love classic manual typewriters! 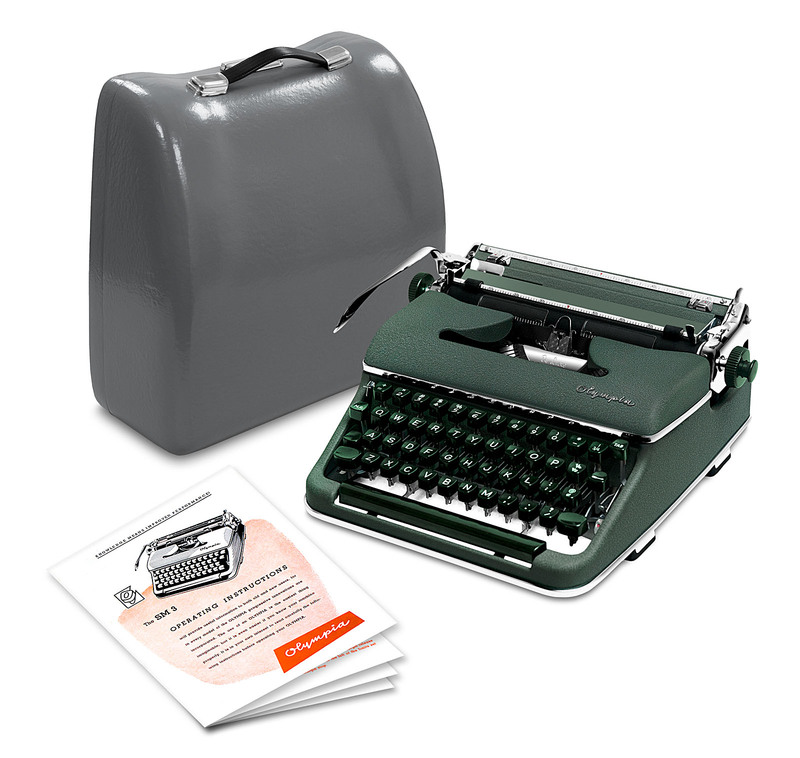 We sell Professionally Restored (Refurbished) portable vintage manual typewriters: Olympia SM3 De Luxe, Olympia SM4 S (Signature), Olympia SF, Olympia SM9 De Luxe. Remington Portable Model #1, Remington Portable Model #3, Remington Portable Model #5 and Remington Noiseless Model #7. Our Expert Technicians spend over 15 hours professionally restoring each machine. Please browse our inventory: Restored Olympia Manual Typewriters and Restored Remington Manual Typewriters. We Never Use Harsh (Poisonous) Chemicals! Our Expert Technicians never clean typewriters with harsh, foul chemicals. Some of those products are known to cause cancer and other diseases. We care about your family and the environment! Our Expert Technicians clean each typewriter using organic, odorless environmentally-friendly products. Our cleaning solutions are safe for humans and pets. They are tough on dirt but gentle on precise vintage typewriter parts. 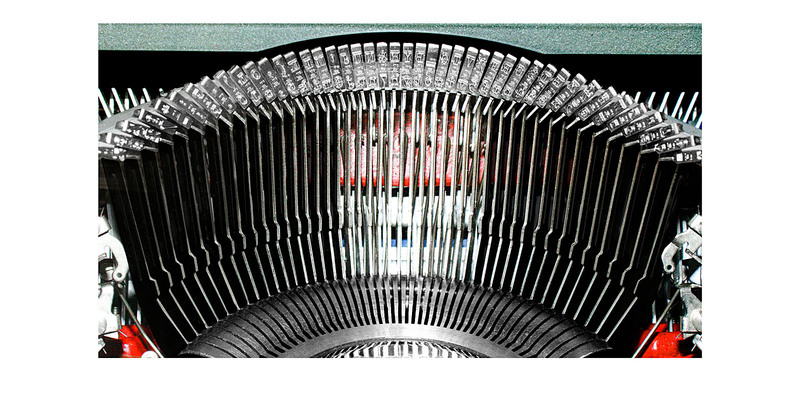 We photograph every vintage manual typewriter in our Studio. What you see is the actual restored typewriter you are purchasing. 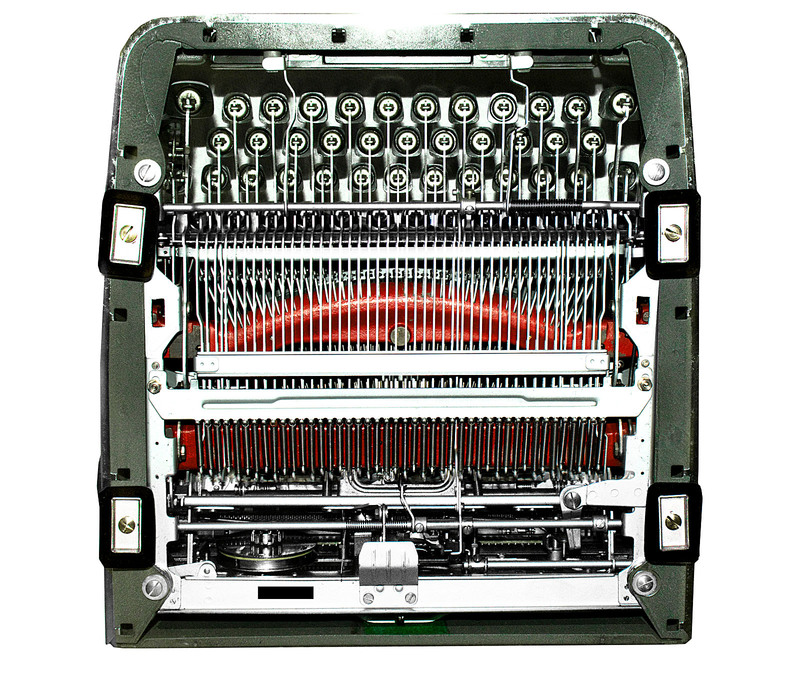 We promise to securely package and ship your vintage manual typewriter within 1 business day. We strive for your total satisfaction! We sold hundreds of Restored Typewriters to our Domestic & International Customers. Please read our feedback reviews. We accept Buyers from U.S.A., Canada, France, United Kingdom, Germany, Holland, Switzerland and several other countries. Customs Fees are the Buyer's responsibility. Visa/MasterCard, American Express, Discover, Paypal balance, instant transfer from Checking account, Credit Card payments. To comply with PayPal Seller Policies, we will only ship to your Paypal Confirmed Shipping Address. From hereon, "We" (Seller) and "You" (Buyer). PayPal or Credit Card via PayPal card processing only for all sales outside the USA. We cannot be responsible for any custom fees or tariffs that may be imposed on any items shipped outside of the contiguous 48 United States. All items are shipped in the condition described in our listings. Any damage claims must be filed with the carrier. By purchasing this item you represent that you are in compliance with all laws governing the importation of this item into your Country/State/Province. It is the buyer's responsibility to know and to comply with the Law of the Land in which you reside. We are not responsible for any items seized by customs. Please be sure it is legal for you to have this item imported into your country. We cannot be responsible for transit times. For whatever reasons, some shipments will take longer to clear customs and delay delivery of your shipment. We only promise to get items to the chosen carrier in a timely manner. Once in the hands of the carrier, we no longer have any control over transit times. ITEM MUST BE RETURNED WITHIN: 30 DAYS. REFUND WILL BE GIVEN AS: Cash Back. Our goal is to exceed your expectations. The package is fully insured. When it arrives, swiftly open and inspect the typewriter. If you notice any new damage, immediately contact the Shipping Carrier to file an insurance claim. If there was a SERIOUS ERROR on our part, please contact us first before leaving negative feedback. We will do everything we can to resolve the situation. Returns will be evaluated on a case-by-case basis. You must ship the typewriter back to us in original condition within 30 days of order date. Shipping costs are non-refundable. All Returns may be subject to Re-Stocking Fee. © Classic Vintage Typewriters. All Rights Reserved. Website Design by Edward Halitsky. PayPal and the PayPal logo are trademarks of PayPal, Inc. This website is a participant in the Amazon Services LLC Associates Program, an affiliate advertising program designed to provide a means for sites to earn advertising fees by advertising and linking to Amazon.com.